Rock County Day in Madison is Forward Janesville's biennial lobbying day at the Wisconsin State Capitol. 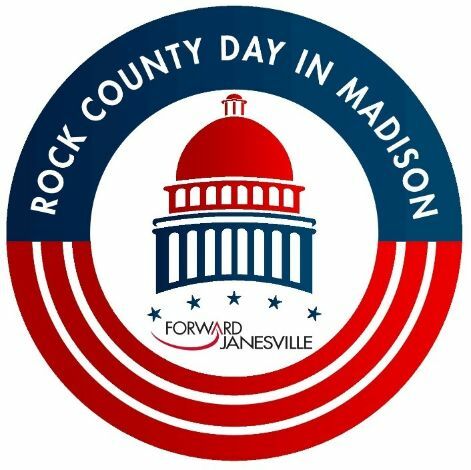 The seventh Rock County Day in Madison will take place on Wednesday, May 15, 2019! Our day in Madison will include a group meeting with our area legislative delegation, a briefing from Wisconsin Transportation Secretary Craig Thompson, and a meeting with Wisconsin Governor Tony Evers! After our meetings, the group will split into teams to deliver copies of our legislative agenda to lawmakers from all over the state. The day will conclude with an optional lunch at a Capitol Square restaurant. Those who participate in Rock County Day will get a fascinating look at what’s going on inside the state Capitol. You don’t have to be an issue expert to participate—anyone interested in knowing more about how state government affects you and your business should participate. With all the changes in Madison, this year’s event is more important than ever! Contact Dan Cunningham at danc@forwardjanesville.com to RSVP for Rock County Day!